OCO is the Voice for Organics in Ontario. A membership-based non-profit association that represents Ontario’s organic sector, OCO is the only trade association working and advocating on behalf of the entire organic industry, from field to plate. Our members are farmers, producers, input suppliers, food processors, marketers, distributors, certifiers, retailers, NGOs, educators, researchers, and consumers who support Ontario’s organic sector. 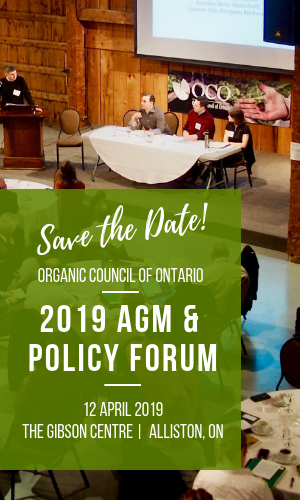 The Organic Council of Ontario is a member of the Organic Federation of Canada (OFC), and represents its members’ interests with regards to Canada’s Organic Standards through the OFC and the Canadian Food Inspection Agency. We have strong relationships with the Canada Organic Trade Organization (COTA), The Ecological Farmers Association of Ontario (EFAO), and the Canadian Organic Growers (COG). OCO’s Board of Directors is made up of representatives from six membership categories that span Ontario’s organic sector. The board sets the strategic direction for the organization, represents the interests of the sector, and provides oversight of the organization's operations. The board consists of several working committees who further guide specific direction and strategies for the organization. If you would like more information regarding OCO’s governance and board structure, please contact us.